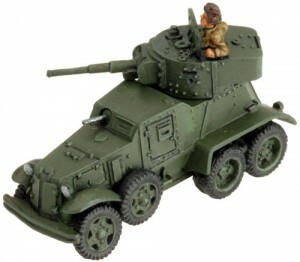 Battlefront is featuring the BA-6 armored vehicle for Flames of War. Experiences with armoured cars during the Russian Civil War (1917-1922) meant that the Soviets had a great deal of interest in the development of more modern designs during the 1930s. In the eyes of the Soviets, armoured cars fell into one of two categories; light or heavy. Light armoured cars were to be armed with machine-guns while heavy armoured cars were armed with guns in the calibre ranges of 37mm – 47mm. The BA-1 was the forerunner to the BA-6 and was based on the imported Ford-Timken lorry chassis. Only a handful of prototype vehicles were built and before mass production could begin the new GAZ-AAA lorry chassis became available; forming the basis of a new design. Known as the BA-3, the new armoured car was armed with the turret of the T-26 obr 1933 light tank. However, the BA-3 was short lived as it was quickly discovered that the chassis proved inadequate. To remedy this issue, engineers quickly strengthened the rear suspension; added a new transmission and designed a lighter armoured body. The resulting vehicle was designated the BA-6. Outwardly, the BA-6 appeared very similar to the BA-3 however the BA-6 lacked the right rear access door that is visible on the BA-3.